I’ve heard people rave about Seche Vite top coat for years now, so when I spotted it in Winners for just $6.99, I picked one up immediately. I made a boo boo, however, and grabbed Seche Vive instead. You see…there’s a ‘V’ instead of a ‘T’. At first I thought maybe it was a knock-off version. But when I looked it up online, I realized there’s two different kinds of this cult-fave nail polish sealer. The ‘Vite‘ top coat is just quick drying. This ‘Vive‘ top coat is quick drying AND has an instant gel effect. Even better, right?! You guys…I’m so happy I made that boo boo and impulsively bought this product when I recognized the brand name. It locks my polish in place for at least a week, and I haven’t experienced any major chipping. Instead the colour just wears down around the tips. But the best part is that it dries incredibly fast. I mean…within minutes! I couldn’t believe how fast my nails dried the first time I used it. I’ve always dreaded painting my own nails because I felt hostage to my couch for at least an hour waiting for them to dry. I even went almost a year with bare nails because I couldn’t be bothered with the chore. There’s NOTHING worse than having to go to the bathroom while you’re waiting for your nails to dry. I really put this top coat to the test the second time I tried it when I did a load of laundry not even 10 minutes after I painted my nails. 10 MINUTES!!! That’s basically unheard of…right? I kid you not…my nails were perfect after touching wet jeans, opening up the cardboard box to get a bounce sheet, and using hangers to dry shrink-ables. 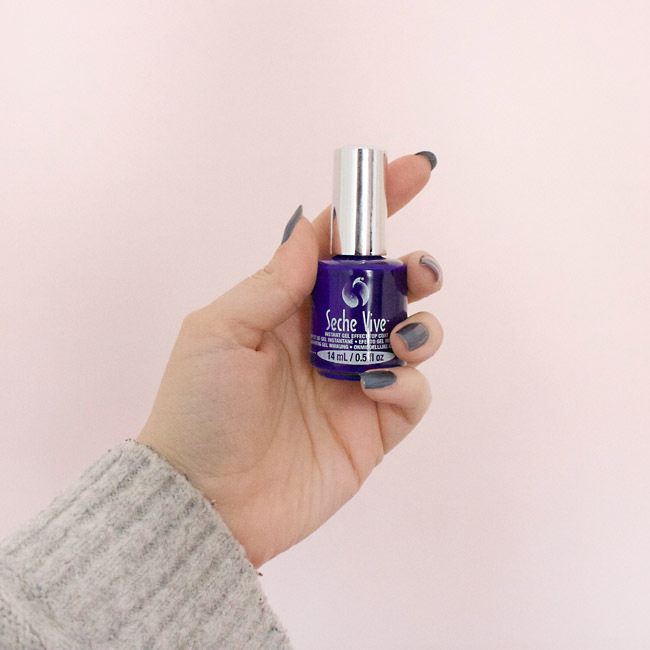 It does have a pretty strong scent, but I’m willing to look past it to achieve the glossy, long-lasting finish (that dries in minutes) when I use this top coat! I’m impressed and next time I spot this little blue bottle for $6.99 at Winners, I’m buying 10 of them.